MB Studio Cloud Radio Automation is the new way to use the full power of MBStudio without having a dedicated computer and an ADSL line performance to ensure the functioning of their radio 24 hours 24. What we offer to start? Maintenance and updating of MBStudio included in rental and performed regularly by our technicians. 1 audio processor 5 bands of high quality already configured. Every time you connect to your remote server with the Remote Desktop software, you feel like you are in front of a computer windows in all respects with the PRO version of MBStudio up and running. With the service also includes an FTP account on the server disk to easily transfer your audio files. 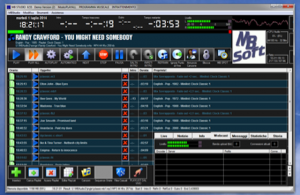 All programming classic MBStudio (playlist, rotations music, file management casual MBSpot etc etc) can be made directly on the remote server when you’re offline. If you want to do all the directing of each audio file using the full power of the editor of MBStudio (start, end, intro, outro, retransmissions, genre etc. etc.) you can install on your local PC DEMO version of MBStudio; do all the directing on files and then transfer them to the remote server already tagged. On Cloud MBStudio you find yourself all pointings made by you in the local as soon as you import the file into the system. MBStudio Cloud comes in 4 different versions. You can switch at any time from a lower to a higher version without having to reinstall anything, and in a few minutes. Everything from. MBCloud can integrate with any plan streaming Shoutcast or Icecast, in addition to the basic plan included in the package. Do you want to try MBStudio Cloud? For you a simple, professional and fully equipped solution. Nothing computer to keep lit 24 hours a 24, no problem due to ADSL underperforming. All your radio is on Cloud, with the power of MBStudio. And you can go on the air live when you want through MBLIVE.